A large group of priests and readers visited the three cathedrals in the united dioceses as part of the diocesan programme of training and education in ministry. These three cathedrals function in a variety of ways, from city cathedral to parish church, to a church in a rural setting. Each has a unique story and historical dimension and attracts tourists for very different reasons. The field trip began in Saint Mary’s Cathedral, Limerick, where Noreen Ellerker brought the group on a tour of the cathedral, which is celebrating its 850th anniversary. She introduced the history of the cathedral, from its foundation in 1168, to recent changes and innovations introduced by the Dean, the Very Revd Niall Sloane. 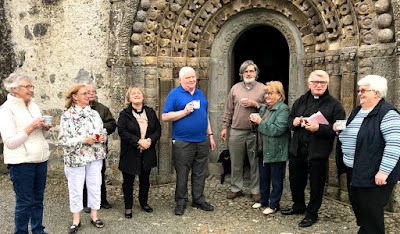 In Killaloe, Co Clare, the group was taken on a tour of Saint Flannan’s Cathedral by the Dean, the Very Revd Gary Paulsen, and climbed the cathedral tower for views of Saint Flannan’s Oratory and sweeping, breath-taking views of the River Shannon, before enjoying lunch in the town. The field trip continued on by road to Saint Brendan’s Cathedral, Clonfert, Co Galway, with its unique Hiberno-Romanesque doorway and the grave of Saint Brendan. The visit concluded with a celebration of the Eucharist. Later, Clonfert parishioners welcomed the visiting group with tea and coffee. During the day, the participants crossed the Shannon many times, and travelled through all three provinces and many of the counties embraced by this diocese.